Mike Perez got fired up to win Big Break Disney! So did you pick the winner of Big Break Disney? Wow! I don’t think Golf Channel could have written a better back 9 script if they tried. I’m still a little speechless. I started writing this post around the 13th hole thinking Tony was a shoe-in given his play to that point, but no sooner did I have him in the title than Mike started his birdie run that just wouldn’t quit. Amazing! Congratulations Mike! I can’t wait to watch you tee it up with your big brother, Pat, at next year’s Children’s Miracle Network Challenge. I hope to talk to Mike this week, but right now I bet he’s partying as hard as he played that day. That man sure has a fire in his belly! Tony was very gracious to speak with me tonight. I am sure it wasn’t easy for him to watch the show and relive coming so close. I certainly will follow the Finau brothers. They’ve been so solid throughout this series. I don’t think it will take them long to make their mark in this business. Well, that’s it for 2009. I sure did enjoy getting to know the Big Breakers on this show. A very special thanks to Vincent, Blake, Kevin, Tony and Mike for taking the time to chat with me every week. I couldn’t have done this without you! And a final “Woohoo!” to Mike for that amazing finale to a great Big Break series. Mike was such a douche during the competition; what an a-hole! I beg to differ, but that’s what makes life grand – the ability to agree to disagree. into play, ego? hit 3 wood any lay back, your ego cost you the big break. I am very disappointed in the attitude of some of the contestants on the show and particularly Mike Perez. You talk about “fire in his belly”, well that may be true, but I consider golf to be a “gentleman’s” game and burying your club in the ground, tossing it in the air on many occasions and blurting out profanities is not the message I would like to see being sent to our children and newcomers to the game. He won and kudos to that but it does not belie the fact that he acted like a spoiled little brat with his temper tantrums. But what do you expect I guess when the world’s greatest golfer(his name shall remain anonymous) has exhibited those same haracteristics on the course. Jack never did that which is why he has my upmost respect, even though there are others who maybe had more talent. Talent is great, but without character and discretion its an empty existence. Big Break should apply etiquette rules to the game also. One way or another, Mike’s obnoxious actions affected the play of the other 2 finalist. I remember in one of the past seasons, one lady golfer finally had enough of another lady golfer’s cursing and hot-headed behavior, and she told her off. She said something like ‘keep it down, we’re already struggling with our own mental game…’ . I sure hope that in the future the judges penalize the golfers (Mike Perez)for their little fits of tantrum!!!! If any children watching this, whom are aspiring golfers, will think that this is the correct way to act on a golf course it sure gives them the wrong understanding. I believe that he should have been penalized strokes for throwing clubs,jamming them in the ground–sorry–he is not the golfer I would like representing Disney Big Break in any upcoming events–sort of leaves a bad aftertaste!!!!!!! Mike Perez is a goofball just like his brother. Tony and the Gipper think they are better than they are. They need attitude adjustments. None of those guys represent golf well and I’m glad they don’t have enough skill so that I’ll have to watch them on the PGA tour. If a player participates here, and knows he’s the eventual winner, he should be classy enough to set aside 10 minutes for the congratulatory interview. Not a week later, when everyone has moved on. During the normal established time frame when blog traffic will be heaviest. Mike didn’t participate last week either, as I recall. Perhaps his club slams and flings have required extra practice. The jerk won. At least I was prepared for it. He sounded like the winner during his interviews here, when he found time for them. Interesting that Vincent and Blake thought Tony’s drive would have been wet, minus the cart path. Tony obviously disagrees. I’ve seen it argued both ways on golf forums. The posters who have played the course say yes. My handicap is no. There is some contradiction. If the conditions were damp, as emphasized by Vincent, doesn’t that lessen the chance of a big roll or kick into the drink? Blake made a great point, that Mike had a couple of smirks during the post-round interview clips that seemed to tip his hand. I saw that and it was an, “oh my gosh, he pulled this out,” moment. They were midway in the program. Early on, the clips made beaming Tony look like a cinch as Mike seemed upset and going through the process solely because he had to. Great job with the interviews, Gayle. I’ll be rooting for Tony and Vincent, based on how they came across here. Too bad Andrew balked. Mike Perez is a douche. It would be interesting to watch this whole cast play a whole round together as a competition. Some of them scramble very well and others are in play so often that when they aren’t in play they don’t seem to recover as well. However, even Tony showed some temper with the little trouble he got in. Maybe if he struggled as much as Blake his temper would have been just as bad. Vincent, Kmax, and Kevin really acted appropriately out there regardless of their play. Good Job Guys! The game of Golf suffers when the bad behavior of those on BBD goes unchecked. Mike is a loser in life. He makes anyone who truly knows the proper behavior for golfers sick. I would urge anyone who cares about golf contact the Golf Channel and register a complaint. The cursing and club throwing is sad. I bet if Disney knew the players were treating the course with such disrespect they would not like it too much. Hey everyone. Thanks for all your comments. Been sooo busy trying to get ready for Xmas, I’ve been very behind on my responses. Sorry about that. I have to agree with some of the other posters…Mike Perez was out of control. Actually, this was one of my least favorite BB series. What gets me is all the talk. I didn’t see much good golf to brag about actually. This cat with the club throwing was one of the biggest tools. He won’t last. 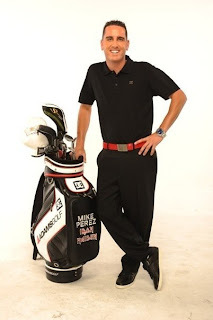 I know Mike P a little bit and have played golf with his/Pat’s father – Tony. Mikey and Tony are the nicest people you will meet. Competitive success demands intensity and that is what you saw. Tiger needs no further detriments brought forth, however, if he were chronicled on a microphone the way the Big Break is, he would be considered the biggest disappointment/whiner/throw his club into a gallery player of all time. Golf Channel needs to edit things by way of soap opera to keep viewers. Keep an open mind. Lastly, Giuliani is the worst player I have ever seen on this show.